Like most British cities, Bristol has a big inner ring road. It crashes through neighbourhoods of medieval houses and 1970s concrete office towers, and it thunders past landmarks from Brunel’s Temple Meads Station to England’s largest parish church, St Mary Redcliffe, a fortress of fast cars and pedestrian cages cutting the old central business district from the rest of the city. But it’s not a ring road. The ends used to meet: from Redcliffe church it continued west over the bascule bridge and cut diagonally through the run-down Georgian Queen Square. Twenty years ago, Queen Square was taking 20,000 vehicles a day, including 1,000 buses. No wonder it was run-down. The council got rid of the vehicles, all of them, and restored the Georgian square, now a calm but popular little park. It remains one of the few notable examples of undoing 1950s-80s urban motorway mistakes in the UK, and it happened at the same time as one of the last of the mistakes, the M11 link, was being driven through Leytonstone. I was a bit disappointed — I’d been expecting them to move on to the other carriageway once this one was complete, for a pair of unidirectional tracks, but they’ve just gone for a bidirectional track using a single traffic lane, which apparently isn’t much help to the gentleman who is using the opposite pavement. Still, the one track is not an unusable width. 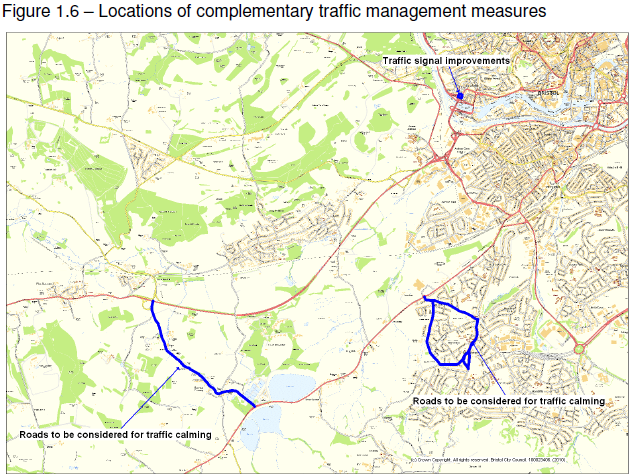 The reason they’ve gone for a two-way track here is that the council are not thinking in terms of fixing individual isolated streets, but nor have they yet got to the stage where they can think in terms of a network. If this were part of a network, you would have tracks on each side linking up to more tracks around the other big roads, as well as to the calmed low-traffic streets around here. 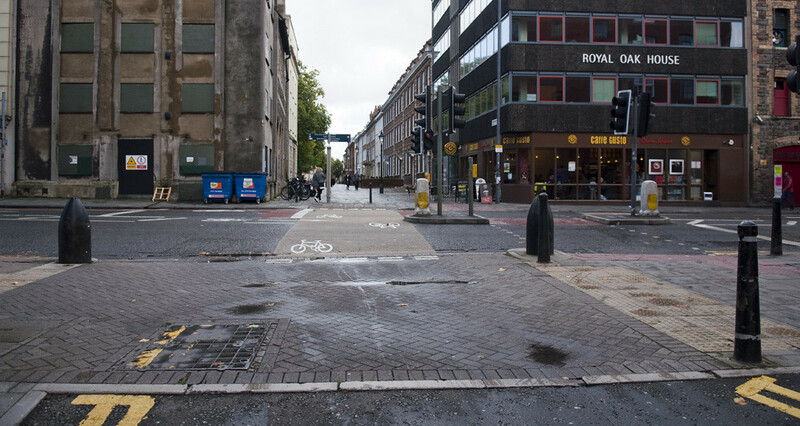 Rather, Bristol is currently thinking in routes — that’s all they can do with the small pot of money they were given to become a “cycling city”. This is one of half a dozen routes that the city was able to create with the project. Lots of shared use plazas, parks, and pavements. That’s fine for access — making it possible to keep riding the final yards to the destination — but shared use doesn’t really make for an attractive through route, especially when it runs straight through a set of tables laid outside a cafe. Bristol already had a lot of shared use squares and parks — Bristolian pedestrians and cyclists seem to be able to get along without one interpreting the mere sight of the other as a near death experience. Little, if any, of the shared use in this video is new, but previously it was designated as shared use more because there was no reason to ban bicycles from those areas, rather than because they made useful through routes. Bicycles have at least been given priority, and a raised table, where the route crosses Welsh Back, from Queen Square onto the bascule bridge — though there aren’t many other examples of this arrangement in the Westcountry, so it might take motorists a while to work out that their “give way” markings aren’t a mistake (notice that the producer of the video clearly had little confidence that the white van was going to give way at 0:57). And there’s no other priority crossings on the route — only some grey-green paint on Prince’s Street, and toucan crossings with very long waits on three different branches of ring road before finally reaching Temple Meads. This is not a toucan. Clearly the cycling city team were going for a cheap option — spreading their little grant thin over as many routes and projects as possible, and reusing as much existing infrastructure, whatever the quality, where they could. 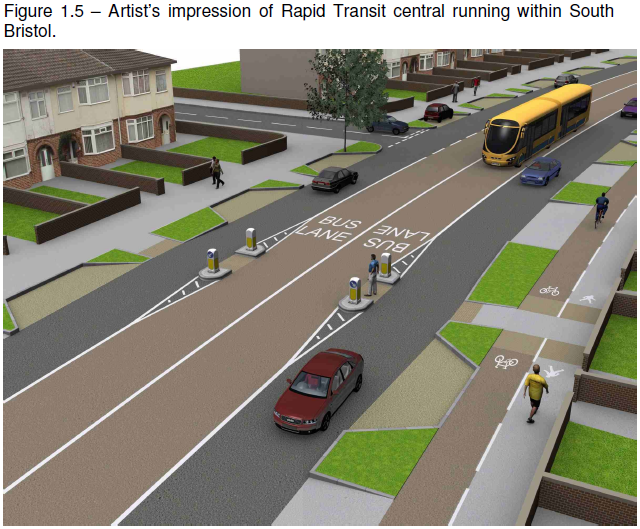 But when it came to a gap in their route, where no existing infrastructure could be commandeered, they’ve taken the time and money to do it right: they’ve taken a traffic lane out to built a proper usable cycle track, rather than dump people on a dual carriageway with the buses. Perhaps it’s not quite as much space as would really be desirable, but it’s enough, and with priority over the minor roads. And they did it, so far as I can tell, without being asked — without the campaign and the fight that was required in Camden. With real funding, I think Bristol could do great things. The cycling city grant must have brought some of the right people in. With the grant all spent, I fear they will have been sent on their way. The local rag doesn’t like it, but I always got the impression that the Evening Post was pretty irrelevant. An SDLP Northern Ireland assembly member has proposed making riding a bicycle in Northern Ireland illegal except where the rider is wearing a plastic hat. I can’t find much coverage of it, but this proposal appears to have already been delayed from August. Also ongoing under-reported news from Northern Ireland, highlighted by Christian Wolmer this week, is the £800 million A5 dual-carriageway construction. The bankrupt Irish government (who are already being prevented from opening another new motorway by the workers who are waiting to be paid for having built it) and the cut-happy British government are going halves on the Derry to Dublin road apparently because it makes for a nice piece of symbolic government cooperation. I’m no expert on the Northern Ireland issue, but my understanding was that the British and Irish governments were already quite good at cooperating, and the issue is instead one of divided communities. 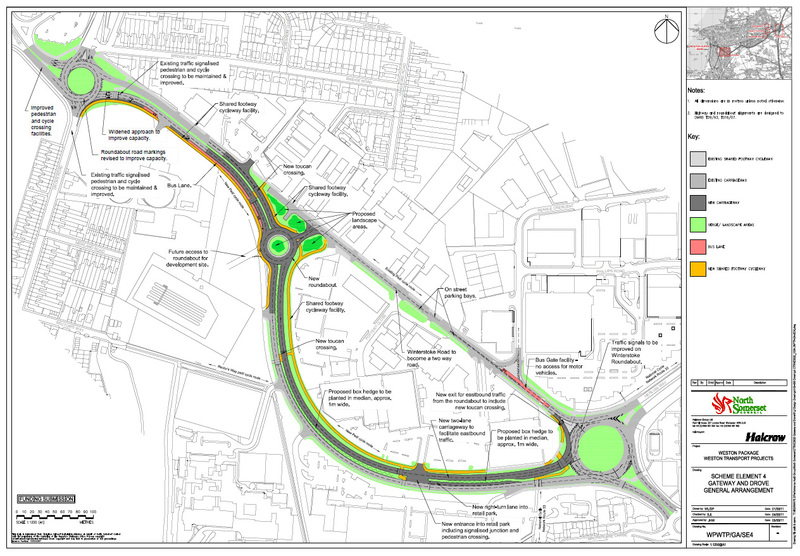 So what could be better than further dividing communities by driving another motorway through them? The DfT has found that 60% of the people who are able to cycle say that they don’t because they think it’s too dangerous. Who would have guessed? And the road haulage industry have noticed that they’re getting rather poor publicity over all the cyclist deaths and victim that’s blame going on — but it’s ok, their PR department are on the case. 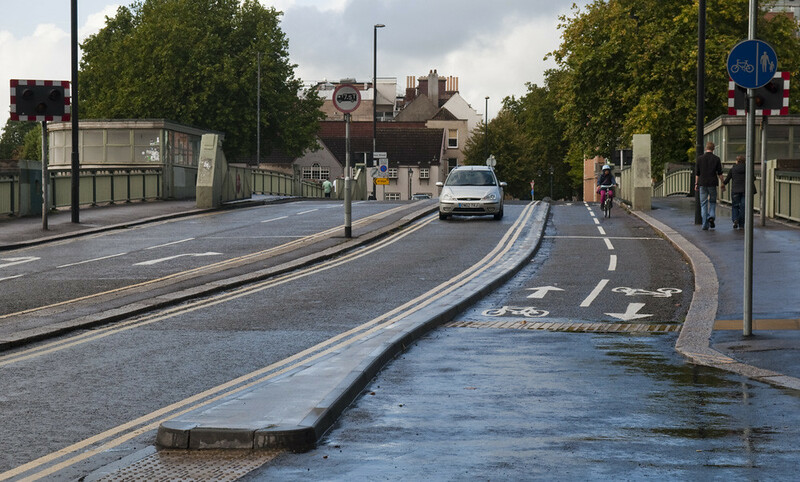 After a slow start, Bristol has allocated all of its £11 million cycle city budget. York is still getting through its cycle city pot, with half a million on routes to and facilities in the station. There is nobody cycling in Blackpool, therefore building cycle paths is a waste of money, say taxi drivers. Blackpool cabbies have slammed the council for creating a road nightmare in the town. “That’s our job,” the taxi drivers said. There’s a 46% rise in those unregulated First Capital Connect season ticket prices outside of central London. Northamptonshire’s road safety partnership is the latest to run out of money and switch off its cameras. A kitten was thrown from a car on the M1. And somebody’s throwing snowballs back at the motorists. An Oxford Tube intercity bus fell over after taking the wrong exit from the motorway. Two pedestrians were killed by a Range Rover driving on the pavement in central Glasgow. The Waterloo cycle hire station is open. I used it last night, and then ran for the train — ten minutes had been wasted running around the Picadilly area trying to find a bike in the first place. Could you put some on Albemarle Street please? Fat coppers break their bikes. Nice acceptable middle-class crime: while local authorities have to cut services, Westminster are owed £18 million by people who think the world should organise itself around their Mercedes. Meanwhile in Kent, nice middle-aged Jaguar owners have a bit of fun killing people on the motorway. Wanking behind the wheel gets you a driving ban. Mobile phone use not considered an equivalent offence. For the benefit of vulnerable road users, the US are setting minimum noise levels for electric vehicles, which will presumably amount to a de facto global standard (unless and until another major car purchasing nation sets a stricter standard). Delightfully absurd transport solution of the week? A system of delivery tubes under Croydon.